Hi there, I will be setting up a 180g Tank over the course of the year. Looking for a water top off container. Will have to be food grade safe. There is a Rubbermade Brute line but i have not been able to locate 1. What else could i use, and where too buy? Have you tried a Janitorial supply wholesaler in your area, they should have one, and they do come in different sizes. I have also seen them used from time to time, have you tried kijiji? Just a thought. Hey thanks, never thought of janitor supply shop. i will check into it. Found just what ive been looking for in Ontario at Ontario*Agra*Piping*And*Supplies*Inc.
Man I am really glad you found it as I can think of a lot of uses for it. I see it has marking on the side. I take it that is for gallons of water? Yes it was difficult to find in Ontario - try to limit shipping cost. Its the Ace Roto Mold Vertical tank 40G, the lid has a vent for pressure relief. 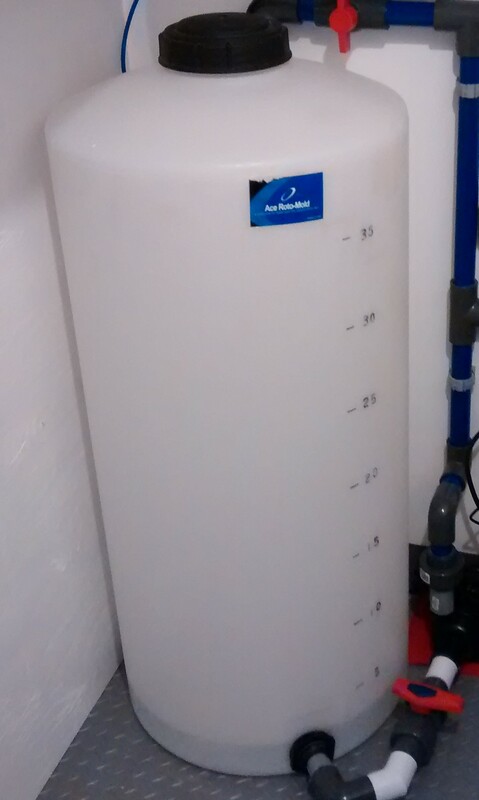 I am plumbing in my Ro/Di water line and hooking up a pump for water/mixed saltwater to Ato/Sump. Are these things still rare to find in Ontario? Greater Toronto Area to be more specific.